This time of year, with days this long and Fridays this short, it takes very little to find cause for a get-together. If the humidity has you feeling a little more sluggish than some, we’ve got you. These out-of-the-box party ideas will keep you and your guests comfortably near the A/C. 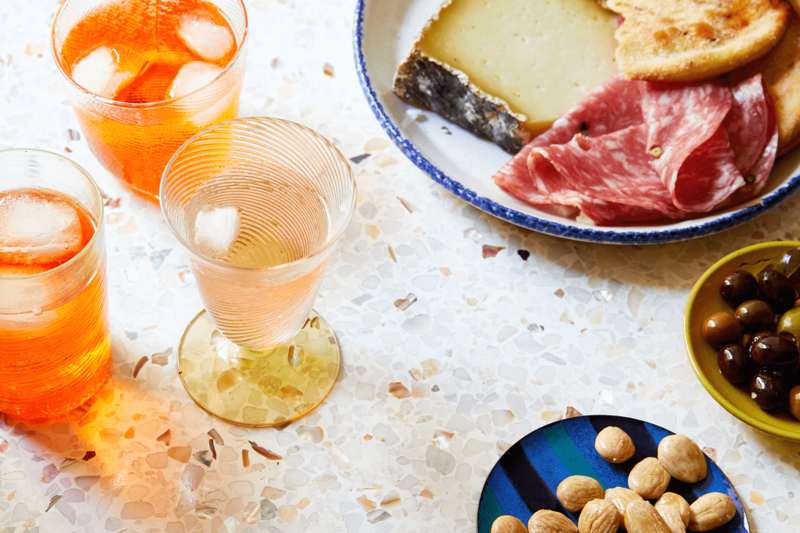 If it’s 7 p.m.in Italy, it’s officially aperitivo time. Roman Holidays are grand and all, but you could just as well skip the jetlag and bring the tradition home. 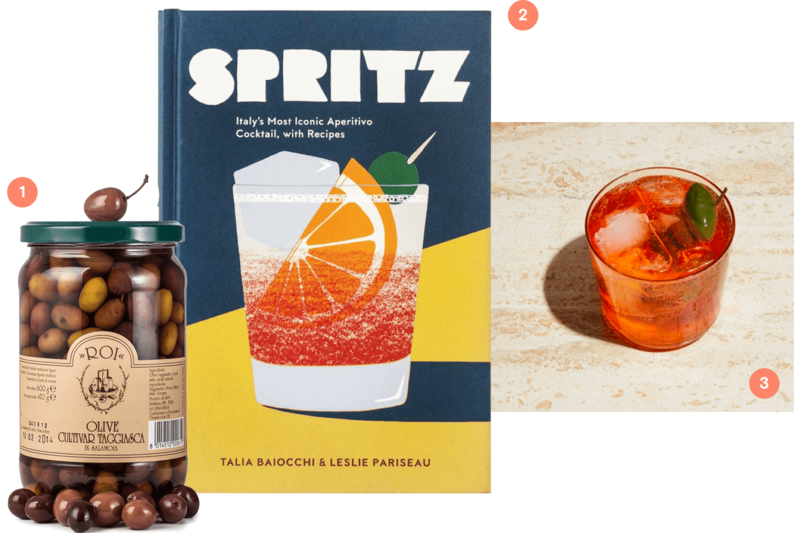 First things primo: what is aperitivo? It’s similar to our concept of happy hour, except naturally more chic. Rather than our version of $3 well drinks from 5-7 p.m. in a dingy dive bar, aperitivo is simply a pre-dinner cocktail meant to open the palate and jumpstart the night’s socializing. Bitter aperitivos play a starring role in the form of a Spritz, the low ABV cousin of the boozy Negroni. Start by letting your guests know this is will be a decidedly more sophisticated gathering, and we have just the Vibe for the job. DRINK: It’s all about the Spritz bar. Set up a station with a mix of aperitivos like Campari and Aperol, soda water, and a sparkling wine like Prosecco. Add citrus, like an orange peel, or olives and guests will have everything they need to craft their own cocktail. Employ the formula of 2 parts bitters + 3 parts wine + a splash of soda water + garnish, and the possibilities are endless. SERVE: Apéritifs are traditionally served alongside light bites, so prepare a spread of olives, crostini, chips, and nuts. Let people mix and match, leaving you free to roam, if you want to. WON’T be complete without: someone making a reference to The Lizzie McGuire Movie, a.k.a the cult favorite throwback Roman rom-com that doesn’t star Audrey Hepburn. 4. A Wild Wild Country, 5. Channing Daughters “Romato” 2014: Astor Wines. 6. Gold Tablecloth: Heather Taylor Home. 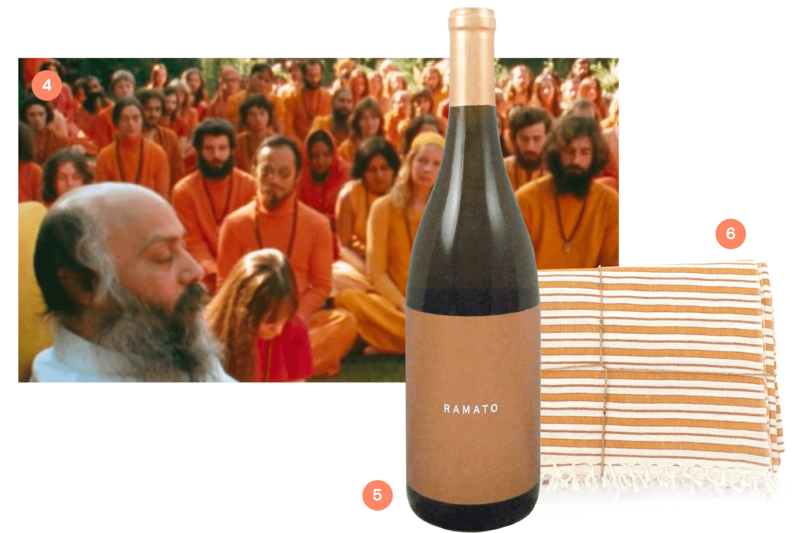 In case you’ve been living under a rock, removed from society (which ironically, the Rajneeshees would love), A Wild Wild Country is a Netflix docuseries about a utopian commune in rural Oregon during the 1980s. Led by controversial mystic, Bhagwan Shree Rajneesh, otherwise known as Osho, and his personal assistant/ice queen Sheela, followers cheerfully engaged in kundalini, systematic poisoning, arson, intimidation, and conspiracy to commit murder. Also, they wear red. When the thought of going outside makes you melt, why not mix it up by turning your dining room into a Rajneeshee-themed dinner party? Niche? Certainly. But Mandy Moore did it, so it’s worth meditating on. SEND: In real life, the Rajneeshees did some stuff that was downright scary. Best to begin by setting a tone much lighter than the dress code with a playful flyer. DRINK: Keep the color palette going with trendy orange wine. Or, if you find orange wine to be, as many do, an unholy option, kick it off the compound in favor of Mezcal Sunsets. Pair with traditional Indian fare and heavy up on the vegetarian option, namaste. DECORATE: Nothing says “leave your worldly belongings behind (or sign them directly over to Osho)” like marigolds and warm-hued linens. A Rolls Royce-fanatic, Osho also had a taste for the finer (read, blingy) things, so don’t shy away from metallic accents. Followers were rarely seen without their signature mala beads, so top each place setting with one for guests to adorn their outfit, then take home as a keepsake. Add tunes, and you’re ready to transcend. WON’T be complete without: strict dress code adherence (we’re talking Diddy’s White Party circa 2007 level commitment). Salmon, russet, or ruby, keep the palette controlled and the country wild. 7. Mionetta Prosecco: Warehouse Wines and Spirits. 8. flower pressed shortbread cookies: Lori Stern. 9. seed packets: Floret Flowers. 10. 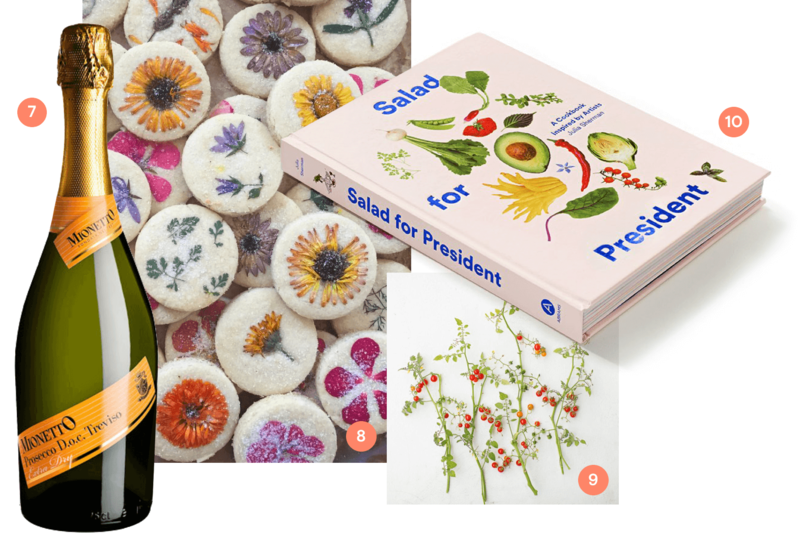 Salad for President by Julia Sherman: Amazon. All these lazy summer days can make one feel, well, downright lazy. Take a break from roasting by a body of water and host a flower arranging party to create some beautiful Instagrams – er, memories – but also Instagrams. No garden? No problem. Whether your go-to is the nearest farmers’ market, flower farm, or even the corner grocery store, flowers are generally easy enough to come by. And if you do have a garden of your very own, there’s no better way to celebrate the fruits of all your hard work and dirty nails than to have some friends over for some arranging and appreciation. SERVE: Unlike the blooms you’ll be arranging, flower pressed shortbread cookies last for up to three weeks and pair well with vino. Balance out the sugar rush with a light luncheon served family style. DO: Lead your guests in the art of bouquet arranging before the day devolves into welcome wine and chatter. Stream video tutorials or go analog with an arrangement workshop from Floral Society to make sure everything comes up roses. GIFT: Robert Lewis Stevenson said, “Don’t judge each other by the harvest you reap but by the seeds you plant,” so by all means, send your guests home with heirloom seed packets from Floret flower farmer in Washington’s Skagit Valley. WON’T be complete without: Every rose may have its thorns, but your arrangement adventures can go much more smoothly with the help edible flower garnishes in every one of your guests’ glasses of rose. Ready to host something your guests will enjoy even more than central air-conditioning? Browse our summer entertaining invitations and Flyer Vibes.